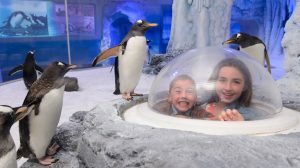 Merlin Entertainments has chosen Illuminate Design to work with their Technical Show-AV department to carry out a range of upgrades to both the London Eye 4D Cinema Experience and SEA LIFE London Aquarium’s new Penguin Point attraction. The 4D Cinema Experience received new technical infrastructure throughout the pre-show area to enable the creative team to develop a more immersive experience from start to finish. A custom relay rack was developed in conjunction with David Cattrell from Eaton lighting systems that provide 48 channels of 32A DMX controlled relay switching. Within the cinema itself, on top of the infrastructure package, Illuminate Design chose Chauvet Illuminarc ILUMIPOD LΩGIC TRI-4 as house lighting, enabling the fixtures to be integrated with the video content. Penguin Point, SEA LIFE London Aquarium’s new home for their Gentoo penguin colony has a flexible power and control distribution system providing the on-site team with the ability to adapt the systems as the seasons change. Working with David Rigby, Merlin’s Specialist AV Lead Technician, Illuminate Design have also supplied a lighting package which includes: Chauvet COLORdash Accent Quad; Cameo FLAT PRO 7 RGBWA; Cameo FLAT PRO 12 RGBWA IP65; Cameo FLAT PRO 7 RGBWA IP65; Cameo FLAT PRO FLOOD 600 HEX IP65; and Martin Rush DC1 Aqua. 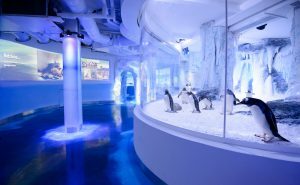 To enable fixture positioning within the penguin enclosure itself, Illuminate Design worked with Triple E to offer a custom solution enabling the lighting fixtures to be installed on Unibeam track over the water that also enables them to be tracked back to an access platform for maintenance.